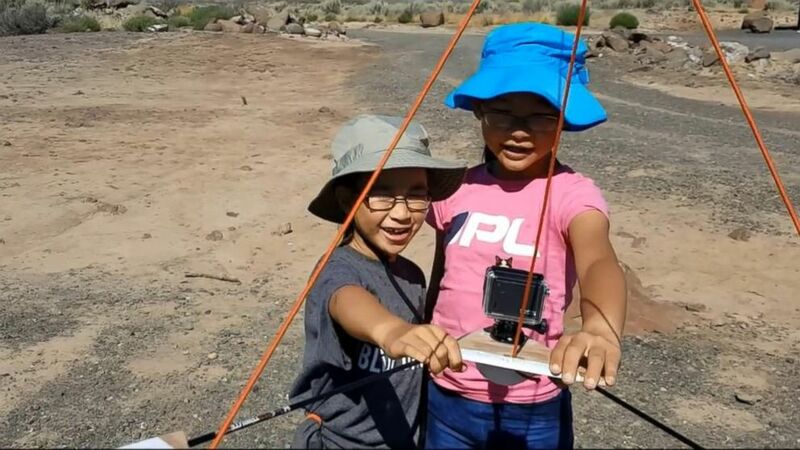 The Yeung sisters are participating in NASA’s Eclipse Ballooning project. Two sisters from Seattle, Washington, are turning their family science project into the opportunity of a lifetime: working with NASA during the historic total solar eclipse. Rebecca and Kimberly Yeung are participating in NASA’s Eclipse Ballooning project in conjunction with the University of Montana on Aug. 21. Rebecca, 12, and Kimberly, 10, built their own balloon craft that they will launch from Casper, Wyoming, into the eclipse's path of totality. The craft will carry samples of bacteria that will help them collect data and photos to be shared with NASA. "We're working directly and launching with the Montana Space Grant [Consortium], which is sponsored by NASA," Rebecca Yeung told "Good Morning America" today. "We're going to be attaching some microbes to our [craft] and NASA is going to analyze that, because the stratosphere [of Earth] is very similar to the atmosphere on Mars." The sisters will use a balloon-powered Loki Lego launcher in their experiment, Kimberly Yeung said. Their balloon is one of five that will be launched during the eclipse to collect data for NASA. "We were looking for a family project to do and we just saw this and decided to do a project like it," she added. (Yeung Family) Sisters Kimberly and Rebecca Yeung will join NASA for a space launch project during the solar eclipse. NASA isn't the first major agency to recognize the sisters for their scientific work -- President Obama invited the duo to the White House's science fair. "When Dad got the call, it was the day before April Fool’s Day, and they said something like, 'Hi, it's the White House speaking,'" Rebecca said, adding that her father told the caller, "April Fool’s Day is tomorrow." But it wasn't a joke, and the sisters attended the fair in 2016. Kimberly Yeung said she wants to turn her love of science into a career someday. "I want to be a robotic engineer," she told "GMA." While Rebecca said she isn’t sure what she wants to be when she grows up, the 12-year-old shared her advice for other girls interested in science. "I would say don't give up because even if some people tell you, 'You can't do this, or it's going to be too hard,' just keep on going and persevere," she said. "Even if something goes wrong, which will happen, just keep on trying." The girls traveled with their dad from Seattle to Wyoming to see the eclipse and launch their project. They plan to share their experience and results with other science fans on their personal blog.